Michael wasn’t acting like himself. His dad’s concerns grew when he became extremely lethargic and noticeably pale. He was taken to the hospital, and tests revealed he has Crohn’s disease, a chronic inflammatory condition of the digestive tract. Michael remained hospitalized for 3 weeks, and his illness has greatly affected his quality of life. He’s had many challenges with his health… intestinal surgeries, a low immune system, and a high white blood cell count building up to Leukemia levels. He also suffers with weekly abscesses. When he walks too much, it causes him to bleed, and when he sits too long, it causes him great pain. Michael’s happiness comes from NASCAR, collecting cars and especially watching his favorite race car driver Kyle Busch. Kids Wish Network was fueled to create an amazing experience for Michael, placing him in the Winner’s Circle. Michael’s wish put him on track with NASCAR, and having him meeting his racing idol Kyle Busch. The week before Michael’s wish, there was great disappointment. Michael had disturbing symptoms that prevented him from traveling, and had to postpone his trip. Due to Kyle Busch’s schedule, this was the only chance for Michael to meet him. He was devastated. Kyle Busch graciously recorded a personalized video message for Michael giving him encouragement to get well, stay strong and follow his career goals of becoming an automobile engineer. Michael felt very special. Over the following days, Michael took medications to help alleviate some of his worst symptoms. A week later, he was cleared to travel. 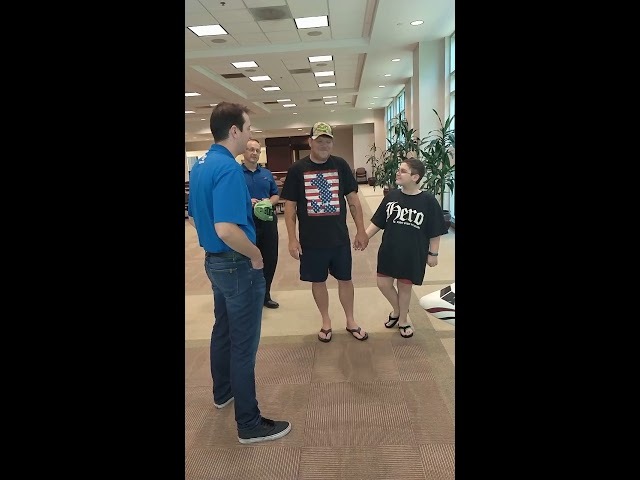 During the wish, Michael and his dad toured Kyle Busch Motor Sports. He felt like a VIP receiving a private tour and gifts. They also visited Joe Gibbs Racing. During his private tour, he met with NASCAR Championship team owner Joe Gibbs. Michael also enjoyed behind the scenes experiences of the shop seeing the pit crew in action, special series of racing vehicles, tool department and trophies. They dined at Longhorn Steakhouse, and kindly received a gift card from the Capital Grille and tickets to the Levine Museum of the new South, since he was not feeling well and unable to attend when scheduled. Check out Michael in the news! !